Hello for sale is my 2007 TT Centenary edition of Arais RX-7 in size medium 56-58 , I bought this at the 2007 TT but ended up not wearing it on the road so would still describe as being brand new condition. There is a tinted visor as well as clear plus pin lock , comes with soft bag as well as embroidered carry case with TT Centenary logo. There was only 750 of these made to celebrate the 2007 TT so therefore not many of these about and especially in new condition. Please strictly no overseas buyers will only post to UK / Ireland thanks , item located Lisburn Northern Ireland so collection is possible in person. 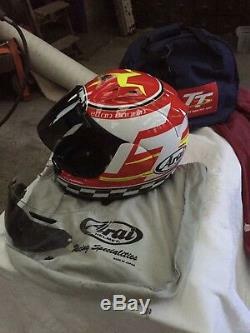 The item "ARAI TT" is in sale since Saturday, January 5, 2019. This item is in the category "Vehicle Parts & Accessories\Clothing, Helmets & Protection\Helmets & Headwear\Helmets". The seller is "38crw" and is located in Lisburn . This item can be shipped to United Kingdom.